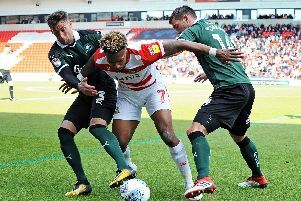 And Doncaster Rovers boss Darren Ferguson has told his squad as much this week, challenging them to string a run of wins together and set themselves up for the run-in. Rovers host Charlton Athletic tomorrow still chasing their first victory of 2018. They lie ten points adrift of the play-off positions and six clear of the drop zone - but that could quickly change for better or worse with three games in the space of eight days. Rovers travel to Walsall on Tuesday night and host Fleetwood Town a week on Saturday. “Anyone underneath that top six that goes on a run are going to put themselves in a good position, and also get themselves away from where they don’t want to be,” said Ferguson. “Someone’s got to do it, so why not us? “That’s really what we’ve spoken about. “Take it a game at a time absolutely, but make sure we’re prepared physically and mentally for the full week ahead. “Starting on Saturday, it’s a big, big week,” he added. “It’s the last time we’ll play three games in a week, apart from the Easter period obviously. “When you have three games in one week things can turn very, very quickly. “You saw how things changed quickly over the Christmas period when we got three wins on the bounce. You can quickly move up that table. “We have spoken about that. If we can have a good week then it really does set us up for the last dozen games. Ferguson has no fresh injury concerns and may consider unleashing Alex Kiwomya for his full debut after the striker came off the bench in last weekend’s 2-2 draw at Portsmouth. “We’ve tried to be as consistent as we can be and we’ll really approach this game on Saturday looking to get on the front foot,” he said. “There are so many teams and it’s very tight all the way up to fifth or sixth position.